Great News! Grant #4 - LCMS Mission Central Support for Missionary Expenses ($10,000.00) has been fully paid! 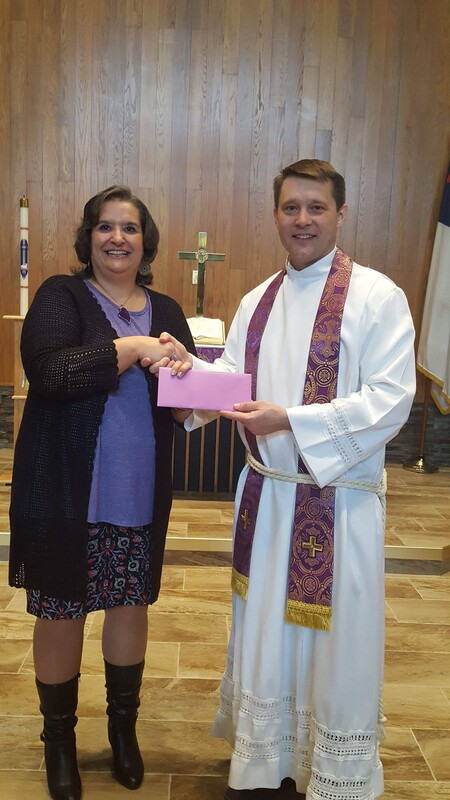 On Sunday, March 24, Zone President Joan Anderson presented the check to Rev. Brent Smith of Mission Central at Faith Lutheran Church in LaCrosse Wisconsin. See the picture of the Funding Presentation! Watch for further details of exactly which missionaries benefitted from this grant in the coming weeks. A follow up article will be posted at that time. The Lord has led the ladies of our district to be generous with their mites. We now turn our attention to Grant #5 - Shelter MySheep - Free at Last Ministry for $20,000.00. Praise God from Whom All Blessings Flow!